• Just the right combination of features to do the job. • Easier to manage than a band. • Manual essential for successful operation. • Won't stand its round at the bar! A versatile composition tool with a novel user interface especially suited to guitarist/songwriters. To get the best from it, you'll really need to first get your head around its features via the manual. This document contains various questions, answers, facts and opinions. Several people have contributed to the contents by way of asking questions or providing answers. I would like to thank all the contributors. If anyone feels that they should have a specific credit please contact me at the above address and I will include your details at the end of the FAQ. Where individuals have answered particular questions I have included their name the text. To date (25/11/1998) Internet searches reveal no other FAQ for the Boss DR-5. This FAQ gives some answers to what may be the most common practical questions. It has some technical content and assumes a basic understanding of personal computers, MIDI and music. The name DR-5 in this document is assumed to refer to the BOSS DR-5 Dr. Rhythm Section. This document should not normally be copied other than for the purpose of producing hard copy for personal use. Inclusion of this document or any excerpts in any other media item electronic or otherwise is forbidden without the written permission of the author. This is to ensure that the contents are kept up-to-date. Web links to the document are permitted. The contents of this document represent my understanding of the workings and normal use of the Boss Dr-5 from experience, the user guide and information received through interaction with other users. I can accept no responsibility for any inaccuracies or consequential problems. The following naming scheme is used to identify the various buttons on the DR-5 front panel. The Data Knob is the large circular knob in the upper-right of the unit that is used to scroll lists and number ranges. The Left and Right Cursor keys are the buttons with a recessed triangular face found between the display and the data knob and are used to move between parameter values. In the body of this document the greater than (>) character is used to represent the right cursor key, and the less than (<) character is used to represent the left cursor key. The display is the large Liquid Crystal Display. The Pads (or key pads) are the 36 buttons below the display. These pads are referred to by the legend on the top of the pad. Depending upon the context the upper legend or lower legend may be used. The Accent keys are the two keys marked ACC1 and ACC2. These keys alter how loud a note sounds. The Tenuto key and Staccato key are marked TENUTO and STACC. These keys alter how long a note sounds. The Fret Shift Keys are the triangular keys found between the ACC1 key and the TENUTO key, marked FRET. These keys alter how the pads are interpreted for tracks 1,2 and 3 with respect to pitch. The Kit Key is marked KIT. The Track Selection Key is marked TRACK SEL. The Shift/Erase Key is marked SHIFT/ERASE. This key is normally followed by a + character and the name of another key. On/Off marked ON/OFF to switch between chords and single notes. Type Assign marked TYPE/ASGN to assign new chord types to pads. Chord Variation Assign marked VAR/ASGN to specify alternative inversions of existing chords. In the Tempo/Data area there are several buttons referred to using the legend above or on the key itself. At present there is no specific Internet location for formal discussion and support of the DR-5 provided by Roland/Boss. Deja-News used to carry records of recent news postings that may include questions or answers to DR-5 problems. This has now been replaced by Google Groups. There are often problems whenyou try to search for 'DR-5' or 'DR5'. First, many posters omit the hyphen, this can be significant when using certain search engines. Many search engines will find many matches on the DR-5 as these characters form part of many names used in other lines of work. Normally you will have to combine the 'DR 5' with other strings to narrow down the search. For example, 'MIDI', 'drum', 'PC' or 'Mac' often work. This group is frequently visited by enthusiasts who are willing to help solve problems and get new users up and running quickly. See section 6 for specific software references. 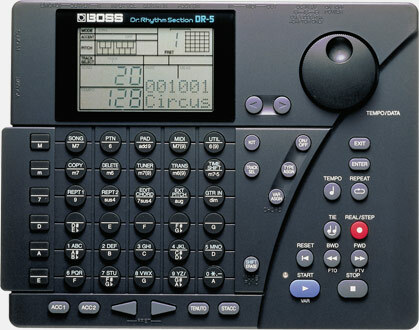 The BOSS DR-5 Dr Rhythm Section is a drum and three track accompaniment sound source. Each mode defines a set of functions that are assigned to the buttons on the front panel. The selected mode remains in force until another mode is selected. A mode is selected by pressing the appropriate pad (one of the top row pads) while holding down the Shift/Erase button. The current mode is displayed in the top left-hand panel of the LCD display to the right of the box containing the word MODE. A common reason for a function not performing correctly is that you may be in the wrong mode. Check the mode entry at the top of the display. They are the 30 circular buttons (Pads) and 5 rectangular buttons (Open string pads) arranged in a 6 x 6 grid below the LCD display. Each pad performs several functions. Plays the sound of an instrument depending upon the current Mode. Changes the current Mode (not Open String pads). Specifies a chord root or chord type (not Open String pads). For tracks 1, 2 and 3 a single instrument is assigned to the whole key pad (i.e. all 36 pads) and the pitch changes depending upon which pad is pressed. For the Drum track a different instrument is assigned to each pad. For chords two pads need to be pressed simultaneously; the chord root in the bottom half of the key pad and the chord type in the top half. This feature only works when Chord Input Mode is switched on. 3.1.3 What are setup parameters? Setup parameters are essentially all the values displayed under the MIDI and UTIL modes. These values specify various settings that define how the DR-5 communicates with the outside world (via MIDI) and how it interprets MIDI information sent to it. The metronome, track volume levels, fret shift and foot switch assignments are included. Please refer to page 11-17 of the Owner’s Manual for more information. 3.1.4 How do I check the amount of free memory? This is the available song memory. Don’t forget to press SHIFT/ERASE+SONG or SHIFT/ERASE+PTN to return to Song or Pattern mode. 3.1.5 How do I initialise the DR-5? Make sure the unit is switched off. Hold down the two Fret Shift Keys and then turn the unit on. You can then let go of the Fret Shift Keys. You should see ‘System Init?’ on the display. Press ENTER to continue with the initialisation, or press EXIT to cancel it. Initialising the DR-5 returns the memory back to the state it was in at the factory, i.e. EMPTY. Please make sure that you really do want to erase all your songs, patterns, chords and any setup data before performing this operation. It is usually a good idea to do a backup of your data before doing a reset – just in case. For help with doing this see the section on backing up. The DR-5 has the capability to record notes. This part of the unit is called the sequencer. These notes are recorded on to four tracks, named T1, T2, T3 and DR. The first three are instrument tracks and have a single instrument assigned to each one. The different notes perform the sound of these instruments at different pitches. The fourth track, the DR track, is the drum track and has different instruments assigned to different note numbers. This means that you can have three instruments plus drums playing at the same time. The name for the complete set of such assignments for all four tracks is a kit. For example you could have a piano on track one, a fingered bass on track two, a harmonica on track three with a Jazz drum kit assigned to the drum track. This is how the Blues 1 kit is organised. 3.1.7 Can I switch the tracks on and off? Yes. You can either mute the tracks via the Util mode, alter the volume setting in a song or set the MIDI volume level for a track to zero. With the T1 flashing (this is the cursor position). Use the Data Knob to select the track to mute. Press >, then use the Data Knob again to select On or Off. That’s it. Within a song you can enter an instruction to temporarily set the volume of a track. Select the Song to be edited and position the edit cursor to the instruction position for the volume setting (you may have to insert a new instruction if this is an existing song). Press REAL/STEP to enter editing mode. Use the Data Knob to scroll down to the end of the instruction menu until you see DR:000, T1:000, T2:000, T3:000 these are the volume settings for the four tracks. With any track selected press > to move the cursor to the volume level and then use the Data Knob to adjust the value. If you wish to change more than one track’s volume don’t forget to press < to move the cursor back to the instruction type before scrolling with the Data Knob. With the ON flashing. Use the Data Knob to select ON. Press >. Use the Data Knob again to select track. Press > again and use the Data Knob to set the level (0=Off). The internal memory of the DR-5 is divided into Preset memory and User memory. The user memory is where you store your songs, patterns, chords and setup information. The contents of this area change as you create and modify your data. The preset area is fixed. It contains one song, two hundred patterns and forty-eight kits. It cannot be changed and cannot be deleted to make more free user memory. In general songs constructed using presets use less memory than songs built using your own patterns and kits. 3.2.1 What is a song? End a repeat section and repeat it N times. Set a track volume level. 3.2.2 How do I create a new song? Enter Song mode: press SHIFT/ERASE+SONGpress > x3 and enter a name. The Chain and I.tmp values can be skipped until later. Press REAL/STEPx2 to enter edit mode. Ensure that the cursor is on the instruction type (left side) and use the data knob to select the desired instruction type. If this is not a repeat start instruction press > and enter the value for the instruction, e.g. the pattern number. Repeat the last two steps until the song is complete. Press REAL/STEPagain to exit edit mode and return to play mode. Press the STARTbutton to hear the song play. It is always a good idea to give a song a name as you may later mistake a song with no name as a free song slot. 3.2.3 How do I edit an existing song? Enter Song mode: press SHIFT/ERASE+SONG. Use the data knob to locate the song name of interest. Press REAL/STEP to enter edit mode. 3.2.4 Can I delete the demo song to free up memory? No. It is a preset stored in ROM (Read-only memory). 3.2.5 How do I change a song’s tempo? Enter Song mode, locate the song name, press > x2, use the data knob to specify the initial tempo. 3.2.6 What is a song chain? Enter Song mode, locate the song name, press > x1, use the data knob to specify the next song number. The chain is terminated by a song with the chain entry OFF. 3.3.1 What is a pattern? It is a list of notes in the order in which they are to be played with additional information such as accent and duration. 3.3.2 How do I create a new pattern? Enter Pattern mode, press SHIFT/ERASE+PTN. Use the data knob to locate a free pattern. Note that patterns 000-199 are presets, i.e. patterns predefined by Roland. These patterns cannot be changed. Patterns 200-399 are user definable patterns for you to use. Press REAL/STEP to enter real time write mode. Press the START button and you should hear a metronome click. Pressing the pads will record the associated notes into the pattern at the point in time that you hit them. When the pattern cycle reaches the end it loops back to the beginning. 3.3.3 How do I edit an existing pattern? Enter Pattern mode - press SHIFT/ERASE+PTN. Use the data knob to locate the pattern of interest. Press REAL/STEP x2 to enter step write mode. The BWD and FWD keys allow you to step through the pattern one time interval at a time, use the cursor keys to view the parameters for a single note and to step to the next note at the same point in time. The time interval which you step through between note positions is defined by the quantize value currently set. 3.3.4 How do I check what a pattern sounds like? Enter Pattern mode - press SHIFT/ERASE+PTN. Use the data knob to locate the pattern of interest. Press START. 3.3.5 What does quantize mean? Quantizing is nudging the notes in time so that the note is played on the beat or on a specified fraction of the beat, for example every quarter. This feature is designed to make it easy to be precise about when notes are played, especially percussion instruments. Incorrect setting of the quantize function in real time write mode can cause strange note sequences as they tend to ‘bunch up’ at the ends of the quantize intervals. On the other hand, entering triplets is made considerably easier through the use of this feature. 3.3.6 What’s the longest pattern I can have? 16 quarter notes, 16/4 measures, i.e. 4 bars of four beats. This is usually more efficient in its use of memory than using four separate patterns. 3.3.7 What does the swing function do? Swing is a feature that allows you to delay the point at which every second eighth or sixteenth note is played, depending on the swing point you select (either eighth note or sixteenth note). It's used in a lot of country songs and some old time Church hymns (for you old timers who know what I mean). There are many songs that don't sound right at all unless you turn swing on. You can try to simulate it with note placement, but it's automatic with swing. Also, if you're programming from a sheet of music in Step Write, and you notice it somehow sounds rigid... Swing might be the answer. 3.3.8 What do I use the tie key for? The tie key allows you to insert notes of a duration longer than the quantize setting in multiples of the quantize setting. The tie key only works in step mode. It also took me a while to figure this out because the manual is unclear. Now, I use this a *lot* whenever I am programming from a sheet of music. 3.3.9 How do I put a chord into a pattern? Enter Pattern mode - press SHIFT/ERASE+PTN. Use the data knob to locate the pattern of interest. Press REAL/STEP x2 to enter step write mode. Step through to the point where the chord is to be inserted. Switch chord mode on by pressing the ON/OFF button in the Chord section. Press and hold down the root note for the chord in the lower half of the key pad. While holding down this pad press the chord type in the upper half of the key pad. E.g. Pressing ‘G’, the right-hand pad on the fourth row of the key pad with ‘m7’, the second pad on the second row will enter/play a G Minor Seventh chord. Note that when inserting a chord into a pattern the chord is stored as individual notes and can eat up memory quite quickly. Specified Pattern Change. This allows you to set the FWD and BWD buttons to switch to a variation of the current pattern via a fill pattern. These entries are set in the pattern header. This feature only works when playing a pattern in Pattern mode. In Pattern mode, select one of the preset patterns with the digit 1 as the last character of the pattern name, e.g. Blld21. This is the original pattern. Press play to start the pattern looping. Once the pattern has played press the FTV button. This will cue a fill and a variation of the pattern (if they exist), and they will be played in sequence without any break in the beat. Once the variation pattern is playing you can press the FTO button to return to the original pattern via a (possibly different) fill. 3.4.1 What is a kit? A kit is a collection of instruments. Volume The volume of the instrument. Pan The position in the stereo image. Pitch The frequency adjustment to change the relative pitch of the instrument. (Only applies to the drum track). Octave Shift The frequency adjustment in whole octaves. (Only applies to tracks 1, 2 and 3). Decay The time it takes for the sound to decay. Negative numbers tend to clip the note and make for a very hard ‘edge’ to the sound, positive number add sustain to the note when the pad is released. The drum track gets an instrument assigned to each pad. Each pad may be assigned any instrument number from 82 to 255. Each pattern is assigned a kit. Each pattern used in a song may use a different kit. The factory settings (i.e. after a System Init) in the DR-5 use a copy of kits P32 to P47 in positions U00 to U15. 3.4.2 How do I create a new kit? Enter PAD mode by pressing SHIFT/ERASE+PAD. Use the data knob to locate a user definable kit - one that is numbered U00 through U15. Kits P00 through P47 are presets and cannot be modified. Press TRACK SEL until the drum track is selected (the word DRUM appears on the display to the right of the TRACK SELECT prompt). Pressing any pad now will display the currently assigned instrument and its parameters. You can use the data knob and the cursor keys to assign a different instrument or parameter value to the pad. When finished press the KIT button again. Technically it is not possible to really create a new kit. All that you can do is edit an existing one. After a reset the User Definable kits are simple copies of some of the presets. Remember preset kits cannot be edited - only User Definable kits can be modified. 3.4.3 How do I edit an existing kit? Follow the same steps for creating a new kit (above). 3.4.4 What is gate time? Gate time is the time that the instrument sound is played for. This is distinct from the decay that comes into play after the pad has been released. Sometimes this is a natural decay because of the instrument used (e.g. piano), sometimes this is artificially applied to create effects, e.g. a long sustain on a flute by holding the pad down. This only applies to tracks 1, 2 and 3. This is entered in real-time write mode by holding down the pad for the duration required. In step write mode the pitch, using the cursor keys at a particular note position accesses accent and gate parameters. 3.4.5 How do I change a pad assignment? Follow the steps for creating a new kit (above). 3.5.1 What is a chord definition? A chord is a root note, type and optionally an inversion. RAM or Random Access Memory is memory that can be written to and read from. It can be changed as many times as desired. RAM is used to store your songs, patterns, chords and setup information. ROM or Read-Only Memory is memory that is fixed, i.e. it cannot be changed. Memory is allocated in chunks and each pattern chunk can hold different amounts of notes depending upon which tracks are in use. Song chunks are allocated as needed. The chunks are then linked together to form a pattern or a song. What you find is a stepwise use of memory. Adding notes to a pattern may not use more memory if they are going into an already allocated chunk. But adding the one that needs a new chunk allocating makes a big difference in how much is used overall. The 200 user patterns and 20 songs is really a limit on two tables. You could use them all up in about 40 patterns and 1 song if you tried hard. 16/4 patterns are more efficient than 4 x 4/4 patterns. The rationale for this is as follows. As patterns are created memory is used up in blocks. First a single block will be allocated to the pattern, then, when it is full of notes more blocks will be allocated. Drum track notes take up more memory than T1, T2 or T3 notes. If you only fill part of a block the whole block is still marked as used and cannot be freed for use in other patterns. 3.6.2 How do I backup memory? The data in the DR-5 can be lost if your backup batteries fail, the unit has to be returned to Roland for repair or if you accidentally Shift/Delete a song, pattern or the whole of memory by performing a System Init. The only way to prevent the data being lost forever is to backup. This can be done in several ways. Backup to your sequencer software. For example Cakewalk has a facility for accepting System Exclusive dump data and storing it in a file on your hard disk. Master Tracks Pro and Dumpster, among others, also perform this task. Use a Floppy disk backup device. There are various devices on the market. Use another DR-5. This can be done using two MIDI cables and connecting In to Out and Out to In. Then dial up a SEQ dump on one machine. This will then send all the song and pattern data to the other. MIDI (Musical Instrument Digital Interface) is a general title for a lot of things. Basically it provides a standard way of allowing a computer and other computer-friendly musical instruments to work together. Specifically, MIDI provides definitions for commands to instruct an instrument to perform a task (usually to play a note or alter a control) and definitions to store these commands in a file, commonly called a MIDI file. Before any MIDI data can pass between your computer and a DR 5 you need to have a working MIDI connection, see section 5. 4.1 What are MIDI events? MIDI events are messages sent between two devices. MIDI events are mainly note on/off instructions or controller instructions. For example each pad depression creates two note events, one at the start and one at the end. These events can be recorded by another device (a computer for example) and replayed at a later time reproducing the original performance. 4.2 What is a MIDI file? A MIDI file is simple a file containing MIDI events. Usually this has been "recorded" by a sequencer. Songs recorded as MIDI really aren’t songs at all, but instructions for a MIDI device to play specific notes or perform specific tasks in the sequence stored. This is why you can’t convert MIDI files directly to some other format. To record to another format, say a WAV file, a MIDI device must perform the instructions and during play, some other component must record the result. 4.3 What are MIDI In, Out and Thru? These are sockets into which you plug MIDI cables. The In socket is to receive data; the Out socket is to transmit data. The Thru socket is used to transmit data onwards to other MIDI devices. 4.3 How do I read and edit a MIDI file? MIDI files are stored in a binary format. This prevents the use of a text editor for reading or editing. Software which knows the MIDI command set is really the only way to access these files. Unless you are a fairly competent programmer I would avoid trying to write a program to read a MIDI file. Use one of the many sequencer packages available to read the MIDI file and display or edit the contents via its user interface. 4.4 How do I get a MIDI file into my DR 5? If you have a PC things are a little more complicated. You can only "record" one pattern’s worth of music at a time. Setup the DR 5 to record a pattern in real time. Decide whether your PC is going to send the timing information or the DR-5. Set the MIDI sync on the DR-5 appropriately: MIDI if the clock signals come from your PC, Internal if they come from the DR-5. Set your sequencer software to reflect the clock settings. If your software allows you to limit what is played to a subset of the track then only select enough to fill your pattern and no more. Hit play on you sequencer program. 4.5 What is the function of the MIDI Thru on the DR 5? The MIDI Thru function simple copies any data received at the In port to the Out port. If this is the only device connected to your PC then this parameter is normally set to OFF. 4.6 What does SysEx or System Exclusive mean? The MIDI standard tries to cover all possibilities in terms of musical instrument control. Inevitably there are always functions which cannot be catered for in the standard as this would stifle innovation and end up with all instruments being functionally the same. The SysEx instruction allows an instrument to cater for device specific data in a standard fashion. This then allows software that knows nothing of the instrument’s special features to work with them. ysEx commands are used with the DR-5 to provide the means to transfer a memory dump of the songs and patterns to and from the PC in a single operation. The DR-5 has many sockets for connecting to the outside world. Below is a list of how to connect and configure these devices. 5.1 How do I connect my DR 5 to a PC? To transfer data you need to ensure that the System Exclusive command number is set the same on the DR 5 as the PC software you are using. The default value is 10. In addition, on the PC you need to ensure that the MIDI interface is set to the external device. You do this via the control panel. Some sound cards require that you physically move a jumper on the printed circuit board to enable this feature. If this is required only perform this operation with the power removed. 5.2 How do I connect my DR-5 to a Mac? Macs requires a MIDI interface, driver software and appropriate cable(s). Install the MIDI interface and associated software. Some interfaces work by connecting via the Mac modem port. Connect the cables to the interface and the Out cable to the In socket on the DR 5, the In cable to the Out socket. To transfer data you need to ensure that the System Exclusive command number is set the same on the DR-5 as the Mac software. The default value is 10. 5.3 How do I connect my DR-5 to an amplifier/mixer/recording device? Use a standard cable pair terminated with ¼ inch jacks into the OUTPUT left and right sockets. The other end of the cable should be connected to a line in socket on your audio equipment. 4 How do I connect a guitar to my DR 5? Standard ¼ inch jack to the GUITAR IN socket, the other end to your guitar. 5.5 How do I connect and use a footswitch with my DR-5? Standard cable from the footswitch into the FOOT SW socket. Use the Foot1 and 2 settings in UTIL mode to define what happens when the switch is closed. This program will allow you to download kits, songs, patterns and chords, save them to, and restore them from your hard disk. It provides viewing, editing and printing facilities. Dr5Edit EV is a free evaluation version of the program. The full version of Dr5Edit includes the ability to upload Standard MIDI files, save and restore individual kits, patterns and songs and compact pattern and song memory. This program allows you to merge a MIDI file with the contents of memory downloaded from the DR-5. The result is then uploaded back into the DR-5. In addition it can be used to create a backup of your song and pattern data. The DR-5 Owner’s Manual covers most aspects of use although it is a little short on examples and is aimed at a more technical than musical audience. It tends to explain what something does but lacks in the explanation of why you would want to do it. Having said that the MIDI specification for the SysEx dump is incomplete. The Song, Pattern and Chord format information is missing. This book provides additional information about how to operate the DR-5 and detailed descriptions of the patterns. Pattern descriptions include key, chords and solo parts. This essentially is a half-hour session with a guitarist who takes you through the process of recording a song using the DR-5. A special thanks to Stephen M.Golden for his contributions and proof reading.